Summary: Increasing the availability of agro-biodiversity will become more and more important, not only in the pursuit of improved crop performance, but also in the context of adaptation to climate change, greater resilience, improved nutrition, maintaining the socio-economic balance of farming communities, and the rehabilitation of degraded ecosystem, asserts the new ZIMSOFF study on Farmer Managed Seed Systems in three selected districts of Mutoko, Zvishavane and Masvingo in Zimbabwe. The study is one of the six studies commissioned by GRAIN and Alliance for Food Sovereignty in Africa (AFSA) for their recent report on “The real seeds producers: Small-scale farmers save, use, share and enhance the seed diversity of the crops that feed Africa”. The study reports that smallholder farmers play a critical role in the maintenance and stewardship of biodiversity, including agricultural biodiversity. They actively select, adapt, and enhance agricultural biodiversity. Women, in particular, play this important role. However, despite farmer managed seed systems (FMSS) being essential to the future of food, they are not well supported by the government. There are no policies and legislation for such seed systems. 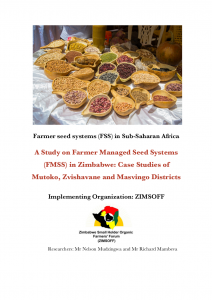 The current seed policies and laws being developed in Zimbabwe and across Africa and globally neither recognize nor support FMSS.